Pranayama, meditation and yogasana form an integral part of a regular school day. This helps the students get rid of their stress and focus on their goals and priorities. 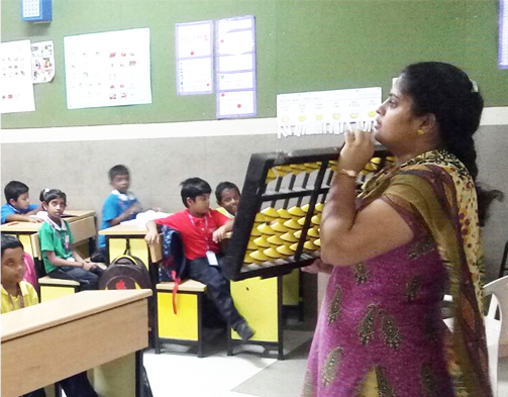 A weekly bhajan session led by students help the school come together every Monday morning. Bhagawat Gita is chanted during the morning assembly. The National flag is hoisted every Monday morning and the integration pledge is taken by all the students. At GTA VIDHYA MANDIR, initial stages of learning are considered very important for the child and hence a structured course, including Abacus & Mental Arithmetic (Aloha International Methodology) is introduced right from the beginning. It helps children learn the fundamentals easily and efficiently. The school is introducing Aloha handwriting improvement course for standards I to VIII to help students develop good handwriting. Aloha Arts programme , a specific curriculum for Arts has been followed in standards I to VIII. Animation is one of the co-curricular activities for standards I to V. Each student is first introduced to the rudiments of animation, then educated on its technicalities and finally trained in all the basic and advanced nuances of 2D animation through easy-to-learn techniques, advanced software and simplified methodology. 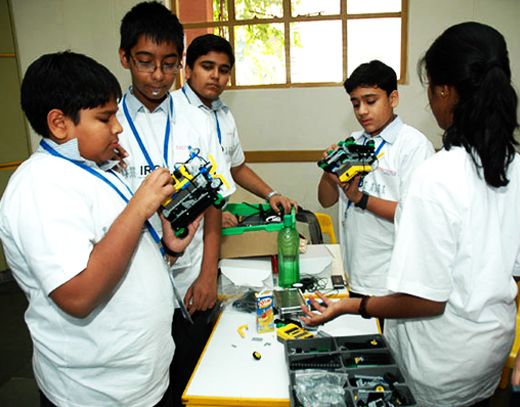 Robotics is taught to students of standards I to VIII following a full fledged indigenously developed curriculum framed by Robotix Lab Research Academy. he curriculum has been integrated with the Science and Mathematics syllabi taught in school. The curriculum designed by Money Wizards is a pioneer in World class money education course for school children, which simplifies and demystifies concepts related to money, investment and finance. SOLE lab focuses on making students techno savvy and in the process make our school text free down the lane. To achieve this goal, our school has been equipped with the SOLE Lab (Self Organized Learning Environment). communication skills. The lab programme includes graded modules in reading, comprehension, listening and grammar skills for classes I to X. 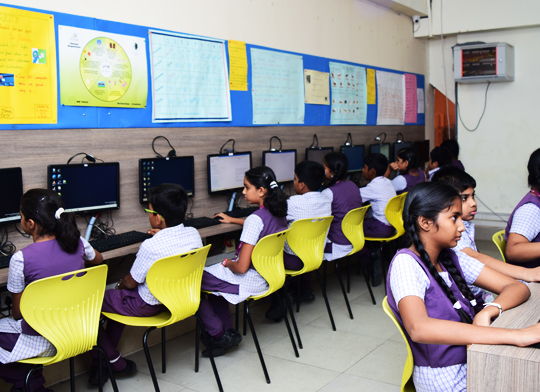 The lab is equipped with 40 computers with headsets to enable students master the art of effective communication. Cambridge Language Assessment is incorporated into the English curriculum for standards I to VIII. Students of standards IX and X are given the option of sitting for the Cambridge Language Assessments. At GTA VIDHYA MANDIR, we follow an excellent CBSE framework that is much advanced and ultimately helps in meeting the ongoing demands of the digital revolution. Technology-aided learning is imparted by preparation and presentation of educational CDs through multimedia. Next Education Science Hands-on kits allow and encourage students to discuss, think & assimilate concepts in a better manner through group learning. Next Education Math Lab sessions help in the learning and reinforcement of mathematical concepts through practical demonstrations. 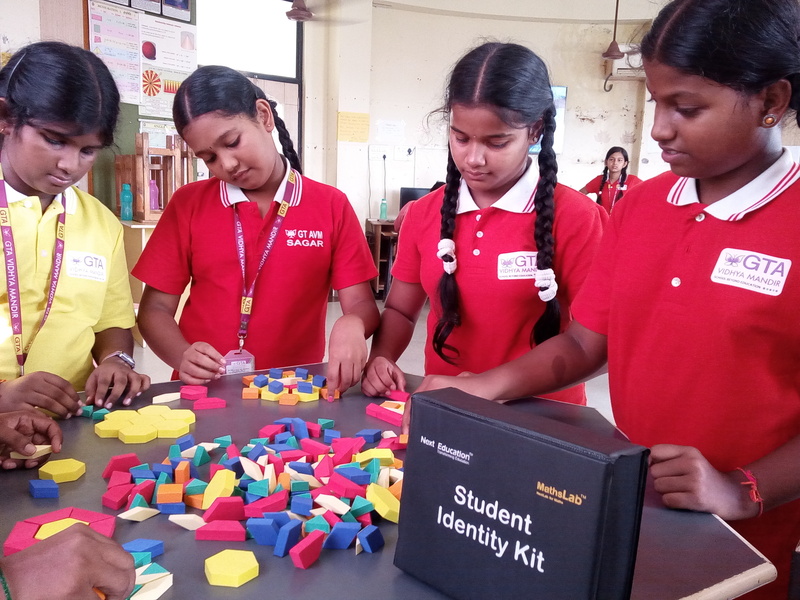 Club Activities, a part of the curriculum, encourage students to bring out their inquisitive and creative best by delving into specific subjects. Students can opt for clubs depending on their specific area of interest. 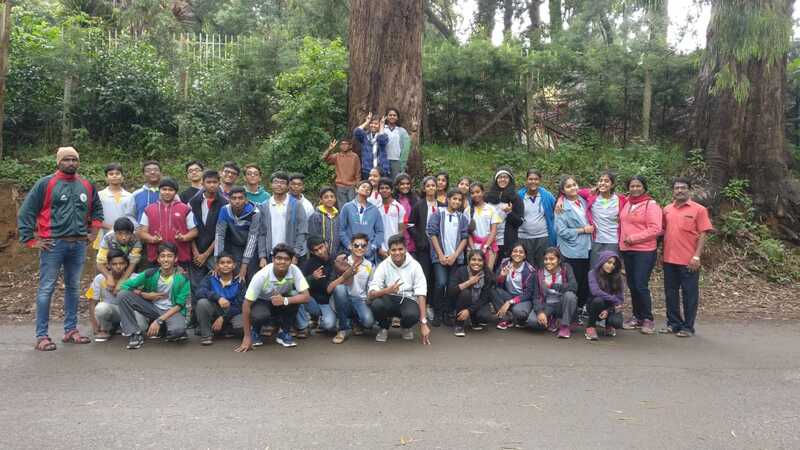 Clubs in place include English, Tamil, Hindi, French, Sanskrit, Math, Science, Social Science, Fine Arts, Heritage, Integrity, Health, Debate, Charity, Eco, Humour, Interact and Photography. 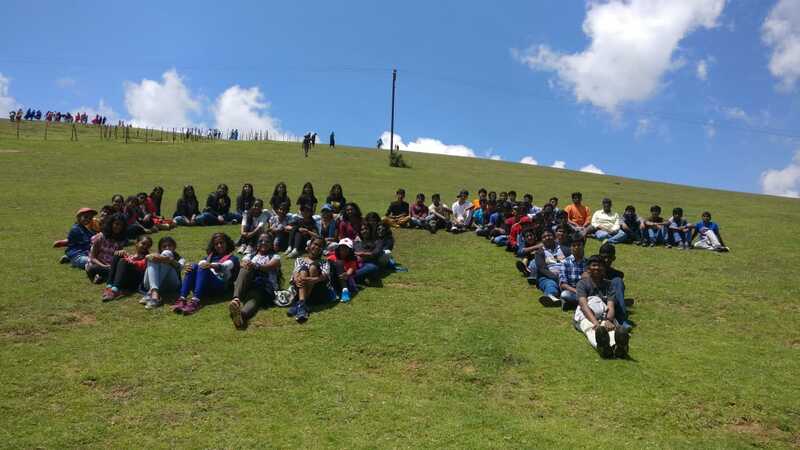 Students are taken on field trips regularly. All students are encouraged to participate in sports such as volleyball, table tennis, archery, chess, basketball, football, cricket and so on. Well-trained and qualified physical education instructors identify talents in students and nurture them in different indoor and outdoor sports from the early stages. 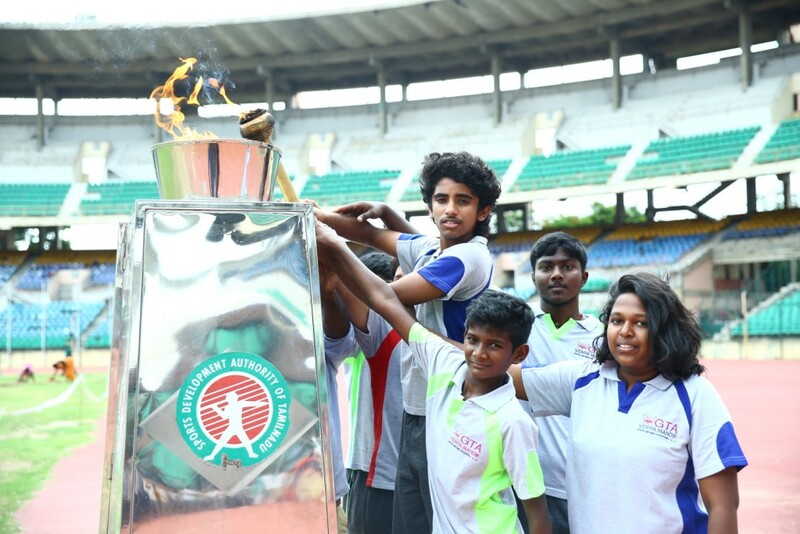 The school also encourage talented and dedicated students to take up the sport that they excel to the next level by participating in national and international tournaments. Service movements that include Scouts & Guides, Cubs & Bulbuls, Road Safety Patrol and Junior Red Cross help build social consciousness in students. 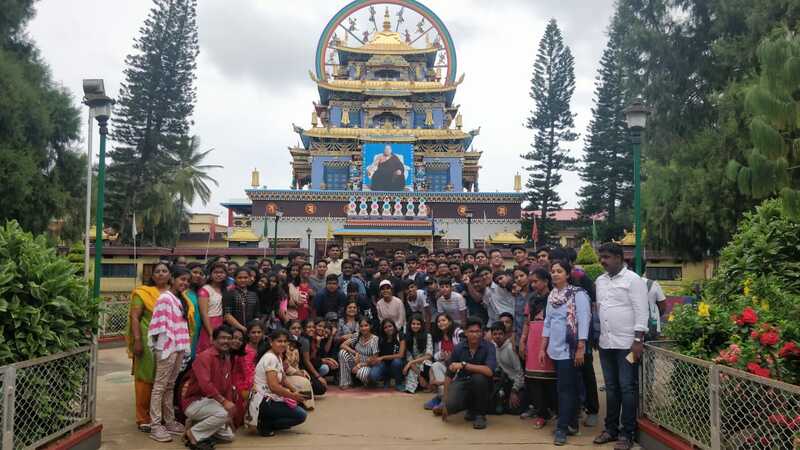 Club activities promote student involvement in various activities including research in their core subjects and community service/charitable work in orphanages and homes of senior citizens. Counselling by a trained student counsellor will address the behavioural problems and learning difficulties of students from Kindergarten to standard XII. 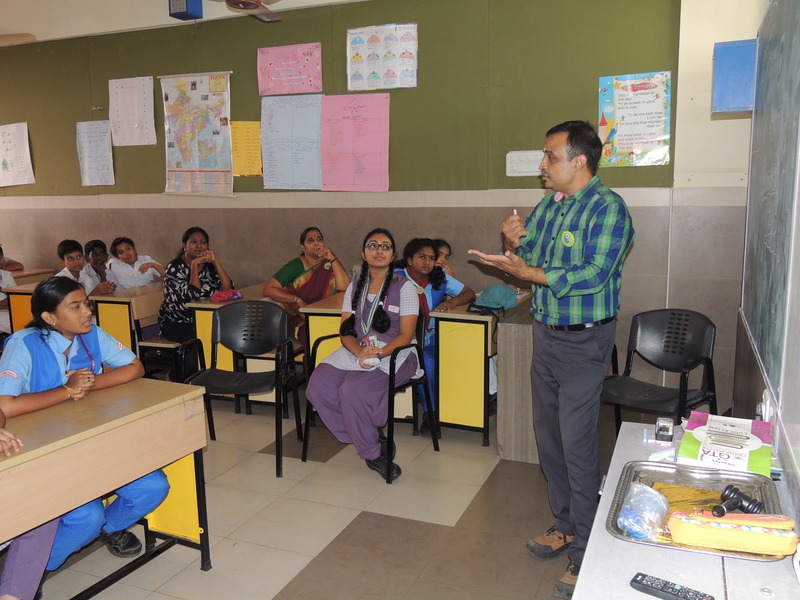 Just Do lt sessions are conducted for students of standards IX to XII to inculcate values and instill life skills in them. Career Guidance is imparted to students of standards IX to XII where they are informed of the available courses and careers to help them make informed decisions about their future.